Click on the button for current Stark County Weather ! Click Here to send us an E-Page. 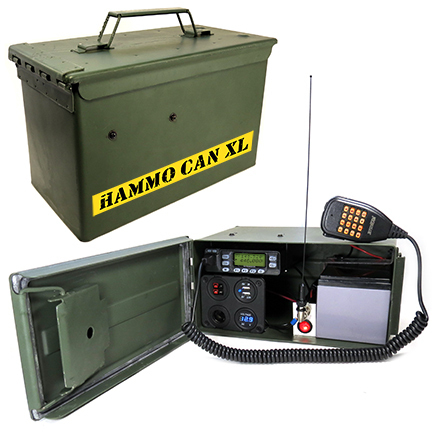 Our new Hammo-Can XL™ is a complete VHF-UHF Station in a box. (Apr 5, 2016) Yes, the radio is included! 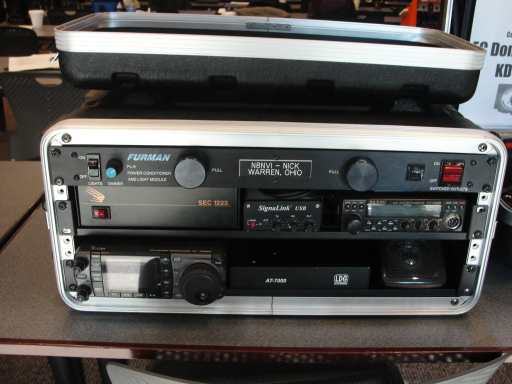 It's a full featured dual-band radio by Jetstream. The JT270MH covers the 2 Meter and 70 Centimeter Ham bands, plus a lot more -- including all of the NOAA weather channels. It is computer programmable, cable and software are included (also supported by Chirp software) with 25 Watts output power. Yes, the battery is included. It's a 12 Amp-Hour rechargeable gel cell that will run the radio for many hours. Recharge it through the convenient Anderson Powerpole connectors. Wall charger, lighter plug cable, and other charging options available. Yes, a dual-current USB socket is included. Charge smartphones and tablets, run LED lighting, etc. Plus a heavy duty lighter socket for convenient power. Bright, easy to read voltmeter also included to keep track of your battery. Yes, two genuine Anderson Powerpoles are included. Charge the battery with any appropriate power source and run external devices. Yes, the antenna is included. Dual band whip with a BNC connector so you can easily swap in your choice of external antennas for higher performance and range. All in a tough and water resistant metal Ammo-Can. Approximate dimensions 11-3/4"L x 5-1/4"H x 7-1/8"H; 15 lbs. 10 oz. Detachable lid with gasket. This new item is available from Quicksilver Radio Products. Visit them at www.qsradio.com. (Dec 27, 2014) - - While I was very satisfied with my latest Equipment or Go-Box based on the Gator 8U Rack Mount box (described below), it did have several limitations. 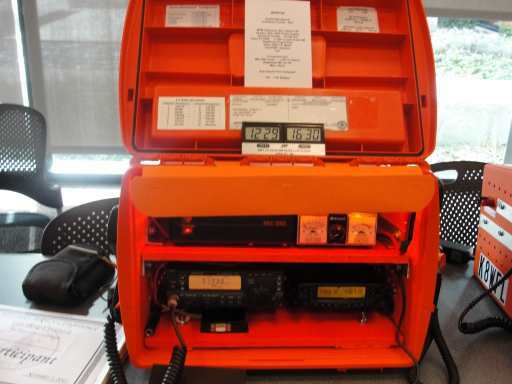 The design intended to include both HF and VHF with the ability to work digital communications, now a standard in emergency communications. When it was finished, I got all that and more. The biggest limitations were weight and power requirements. It still ended up very heavy (nearly 60 pounds) and was dependent upon line voltage power to operate. With my latest box I went in a slightly different direction. I wanted something smaller and lighter and would incorporate battery power. 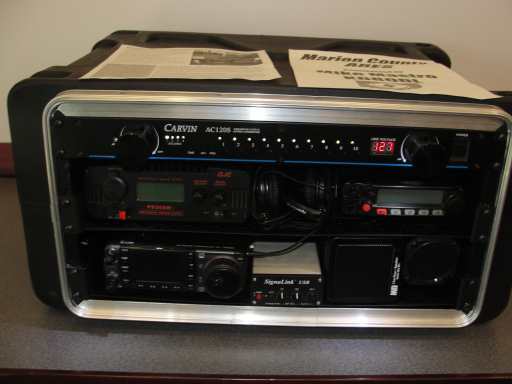 I started looking at different enclosures on line and during my visit to Dayton Hamvention last yearI found what I was looking for. They are called IPortable equipment boxes and racks and they are available in multiple styles and sizes. After much consideration I chose the IPortable Pro which includes an built-in speaker and basic radio pre-wiring. The cabinet in made of solid birtch material and is finished with Dura-tex paint for a rugged and very profissional finish. It includes a single rack shelf for equipment mounting. Although it is a bit expensive, it is worth the money and was on a Dayton special price. The supplier is local to the Dayton area and you can checkout his entire inventory on his website at www.iportableus.com. 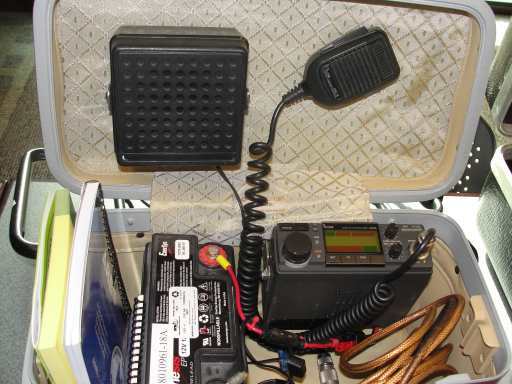 This version of my Go-Box was designed for VHF operation and battery power. 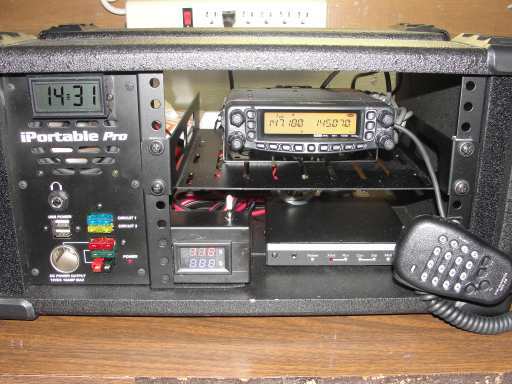 As you can see from Figure 1, I installed my spare Yeasu FT-8900 Quad Band mobile which easily mounted to the rack shelf with room to spare. You could just as easily mounted any of the newer small profile HF rigs popular today. I also added my spare Kantronics KPC-3 plus TNC for Winlink and other digital operations. At the November Massillon ARC Hamfest, I bought a nice panelmount digital voltmeter that I installed in a small plastic project box I had from a previous project. You can see it on the lower left side of the picture. The box is held in with velcro until I decide on a permanent location. Figure 2 is the rear view. I don't like cutting the radio power cables and dressing them up neatly proved a challenge but I am still working on it. Inside the box are also the interface cables needed for the TNC and computer. On the right side you can see my 12 volt 8 Amp Hr battery. A simple metal strap holds it securely in the box for transport and Anderson PowerPole connectors make connections simple and allows for recharging without removing the battery. Finally the box comes with easily removable front and back transport covers. A sturdy side handle works well to carry the unit. The finished product weighs in at about 12 pounds, somewhat portable. I have displayed the box at various hamfests and have received very favorable comments. This makes a fine addition to my ARES Rapid Response equipment and should provide years of reliable service. Figure 3- The Go-Box with transport covers attached. 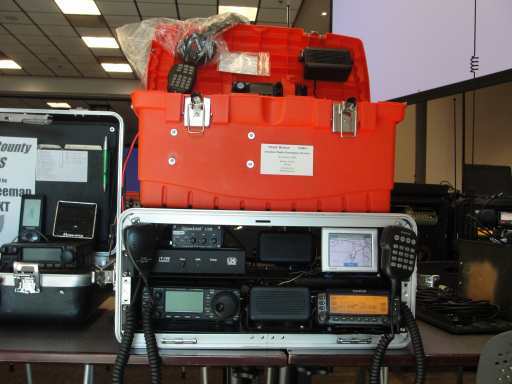 (Feb 2, 2014) - - An equipment or “Go-Box” is quickly becoming an essential part of every radio amateur involved in public service communications. More and more, amateurs are being asked to quick deploy to everything from local public service drills to disaster scenes. There are many types of Go-Boxes currently being assembled by amateurs. Mostly they are based on individual needs and available equipment. 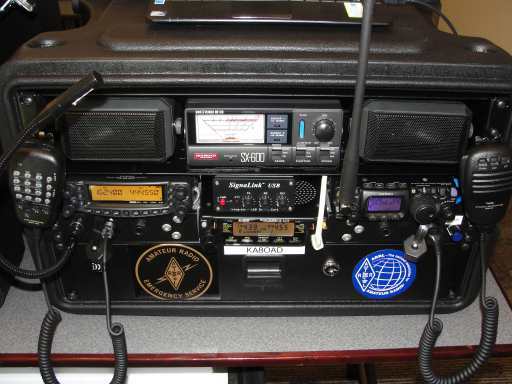 After I acquired the Icom 706, I decided it was time to assemble my own version. 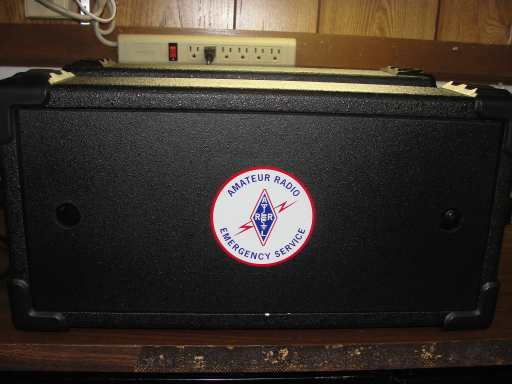 My first Go-Box was built into a utility box from MTM Case Guard Products. While it was functional, it lacked good access for service and no extra storage. It also had a very heavy power supply. My current version is based on the popular Gator Roller Rack Case. Built-in wheels make transporting the box very easy. The same equipment is used in this version with two exceptions. 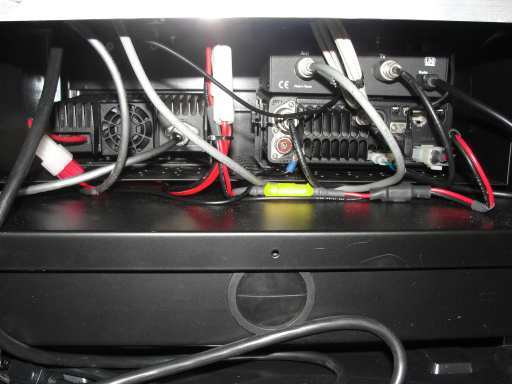 The old power supply was replaced with an MFJ compact switching supply that weighs only 3 pounds. The second revision was digital operating now uses the SignaLink USB unit. 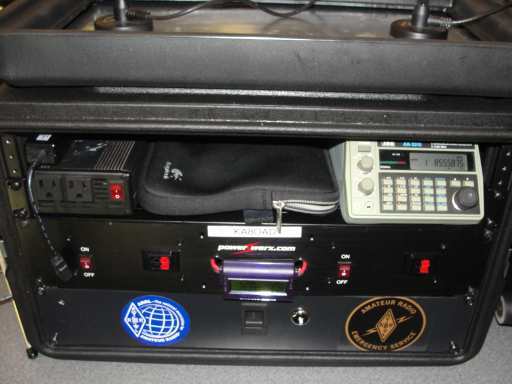 The case also utilizes a storage drawer which houses equipment manuals, a laptop computer, RF connectors and adapters and other misc accessories. This design is a vast improvement over my first box but was more expensive to assemble. 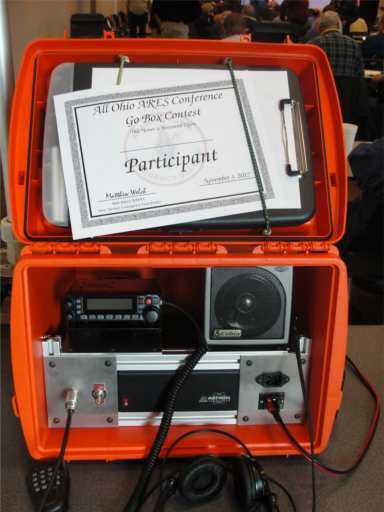 Go Boxes have been the main focus of many articles in amateur radio publications and during present and past meetings of the Ohio Section ARES. Over the last several years I have been collecting information on Go-Box design and have fabricated several different types. Continued below I have posted pictures of my designs and those of the many amateurs in the Ohio Section that have constructed their own versions. Please have a look at the many different type and think about what you would like to build. Feel free to use any of the designs shown and if you build your own, please consider sharing a short recap with me and include a picture for me to add to our collection. This was my first design as noted above. While it was functional, it had several disadvantages that became a problem. One was weight which caused a problem carrying it about. Finally the carry handle broke due to the weight. A fine first design but I wanted to improve on the design. This design came about during a need to have higher power than a handheld that could be used when an amateur operator is asked to "ride along" in an event vehicle such as a city bus or SAG car. 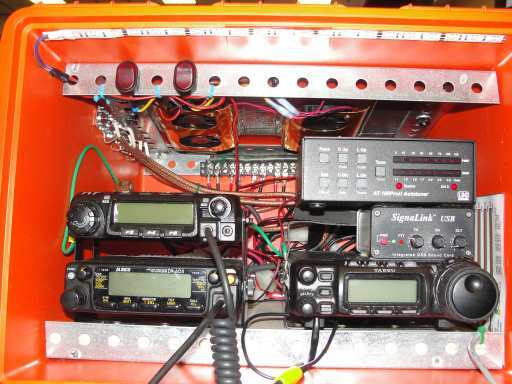 The rig is an Icom IC-2720 dual band using a remote control head. The Toughbuilt tool bag has three compartments that worked well to lay the main rig body in the center with dual 7 Amp Hour batteries on either side to balance the weight. A small external speaker is sitting in the center. The control head is held by velcro to the bag carry handle. Side storage compartments held paper pads and pencils. 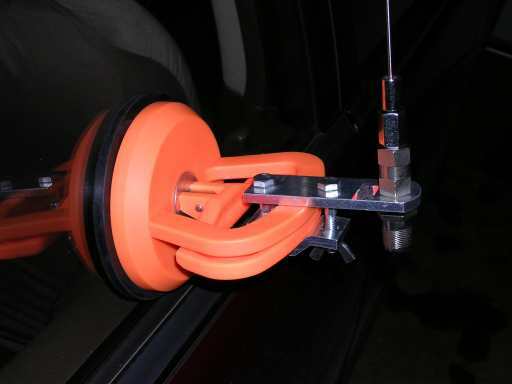 An external antenna is easily connected to the rig and can be mounted to the outside of the vehicle. A closer look at inside the Go-Bag. All equipment can be easily removed if needed for maintenance or to recharge the batteries. 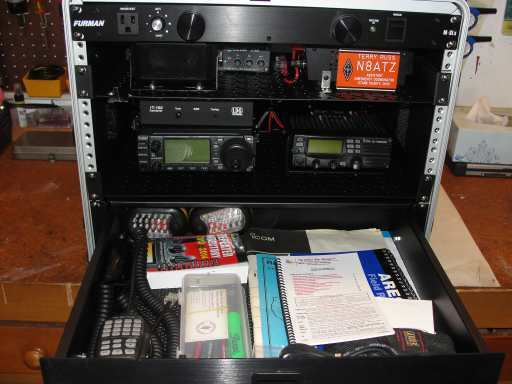 My current version of the N8ATZ Equipment Box is based on the Gator 8U Box. This box comes with a built-in suitcase style rolling wheels making transport much easier. These cases are normally used in the music industry to house equipment used on stage. The equipment side. 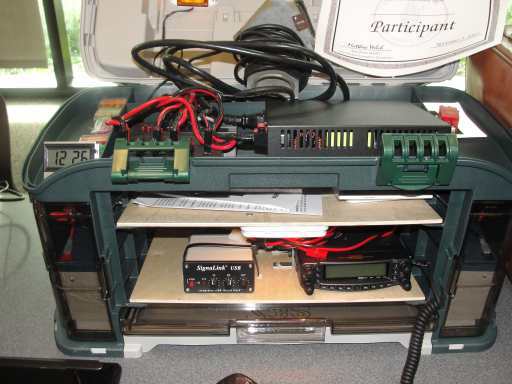 HF is an Icom 706 M2G with the LDG matching tuner. 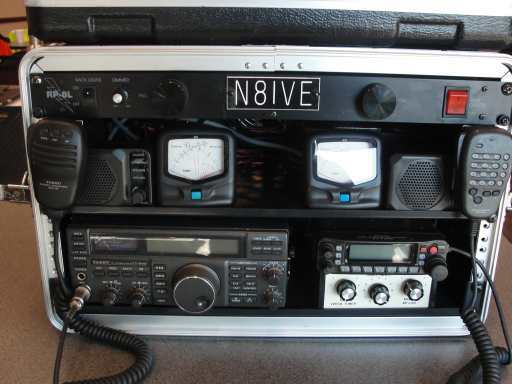 VHF is an Icom V8000 single band rig. Power is using a newer MFJ Switching Power Supply rated 30 Amp. Digital needs use a SignaLink USB unit. An Opex external speaker is for HF. A Furman power strip is across the top which has two built-in LED lights. The deeper case was chosen to accommodate a two inch storage drawer. Extra supplies are stored here including a small laptop, dual band HT, repeater directory, additional lighting, equipment manuals, pens, pencils, paper and other needed items. The rear of the box showing connections and wiring. Power is distributed using a small PowerPole block. 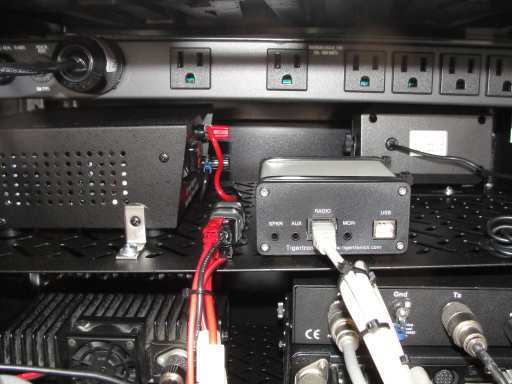 The power supply also has two extra power pole connections if needed. The rear lower portion of the Gator Box. Wiring is neatly routed and wire tied as needed. A 19 inch short rack panel was added later to accommodate two SO-239 feed thru's to make antenna connection much easier. Currently the design is based on using 120 volts to power the box but there is room in the box to incorporate several 7 Amp hour batteries for field use. 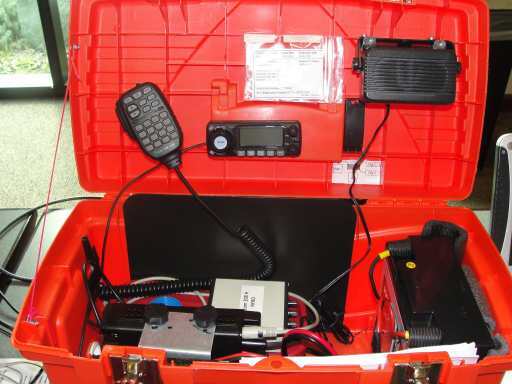 (Dec 22, 2017) .... During construction of my original Go-Box several years ago, I've learned a lot about having and deploying a rapid response equipment box. While it was very functional, it ended up with a number of less desirable features. The main drawback was weight. Constructed using a Gator 8U box that did have a suitcase style pull handle, once all equipment was installed it topped out at nearly 40 pounds. Just getting it and out of my car back seat was rough. Size was another drawback. Too big to fit in most car trunks meant fitting it in the front or back seat. Eventually I upgraded to an SUV which helped out a lot. 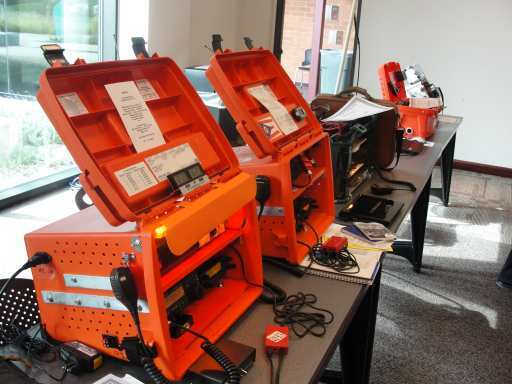 During my visit to Dayton this year I was anxious to visit the IPortable folks who are innovators in small platform equipment enclosures and plus they are from the Dayton area. This year one new design caught my eye. Called the IPortable Pro2 Rack, it comes in two styles. One is a 4US Shallow and the other a 4UD Deep box. 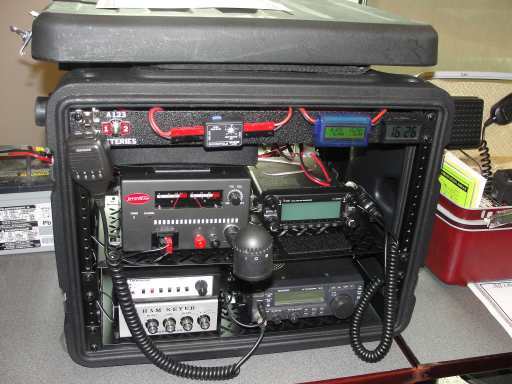 Either rack system are the best functional design for portable communications work. 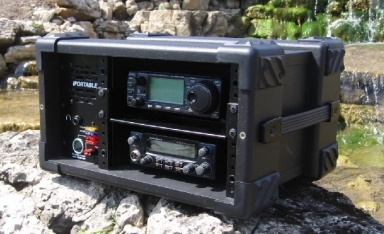 Compatible with nearly all of today's small platform HF/VHF rigs. 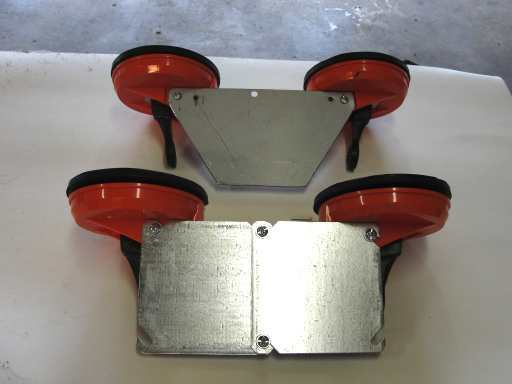 They are made from ABS plastic and aluminum construction that uses butterfly latches on the front and rear lids. The rear lid even has a zippered pocket big enough to store multiple items. My completed box weighs in at less than 20 pounds, much easier to carry than my original design. The picture below shows my nearly completed box minus a few trip covers. 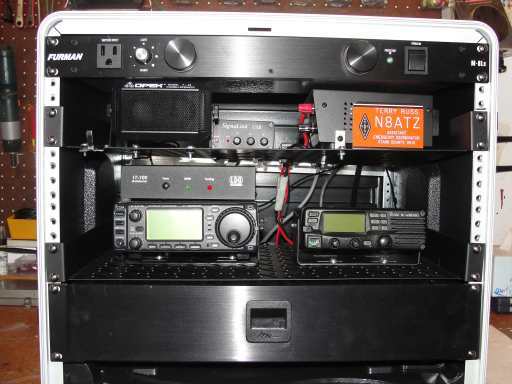 Since my Icom 706 M2G covers from HF to UHF, I eliminated my Icom V8000 rig saving both weight and space. My LDG automatic antenna tuner and the SignaLink TNC round out the equipment. 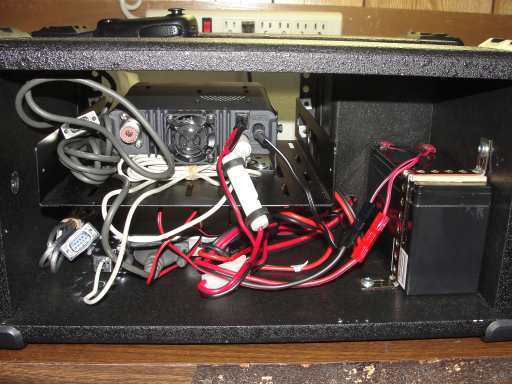 A small 30 amp MFJ power supply fits neatly in the back. As expected the box was a bit expensive but they usually provide a Dayton Deal small discount. Mine ended up costing about $300.00 that included a nice Led strip light. I am very pleased how the design worked out and truly is a portable unit easy to carry for any communications drill or outing. Their website is www.iportableus.com. The box includes a nice power wire harness and built in fusing and speaker that saved a lot of time from my old design. 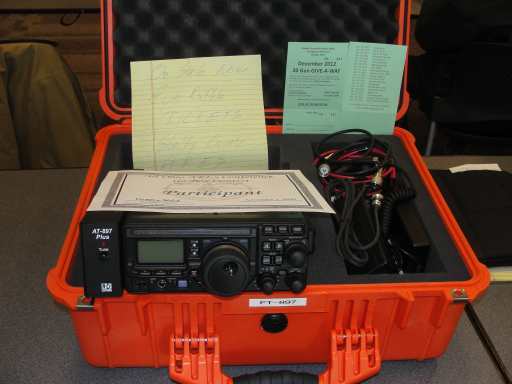 (The 2018 Version) During this years trip to Dayton Hamvention I brought back several items to make up yet another Go-Box project. The first one was my version of the popular Ammo Can from Quicksilver Radio. They offer a complete unit for about $350.00. It's a fine Go-Box but the price was a little steep for me. Since my current passion is to build my own version and see how much money I can save. Menards carried the metal Ammo Box for about $10.00. The Quicksilver design used modules for switching, metering, etc in a kit with a mounting plate for about $35.00. 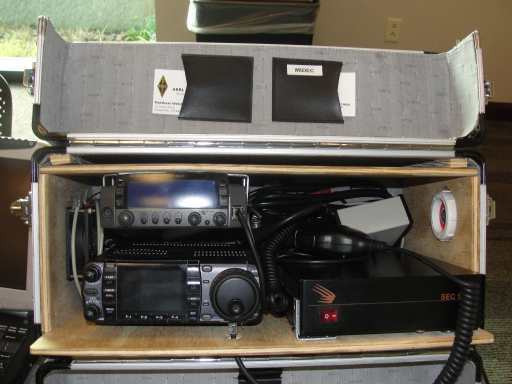 I have had an older small size dual band mobile by Jetstream, Model JT270MH. I haven't yet found a suitable rechargeable battery that I liked so my version uses two 6 volt lantern style batteries that fits easily in the box that cost about $4.99 each. They lasted nearly all summer with intermittent use. The finished version is shown below. Total cost was well under $100.00 thanks to a well stocked work bench. While not as portable as an HT, I have a 10 watt dual-band mobile that will run nearly all day on two 6 volt lantern batteries. If you are looking to build a nice functional Go-Kit you might want to have a look ! Additional designs were shown during several Ohio Section ARES meetings I attended over the last several years. The pictures below show numerous different designs I saw. This should give you some idea if you are planning on building your own Go-Box ! (Apr 1, 2012) --- As amateurs involved in public service events, we are often called upon to setup communications in a number of unconventional places. In the last few years we have been asked to provide communications in everything from RV's to Rescue Squads to City Busses. The trouble with some of these vehicles is that the bodies are aluminum, not suited to amateur magnetic mount antennas. This forces us to use our hand held using only it's stubby antenna. This means limited range making reliable communications impossible. After some research and discussion at ARES events and meetings throughout last year, a few ideas came to mind to overcome this problem. 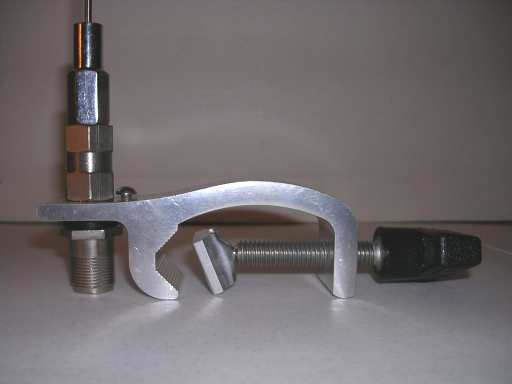 It's a simple antenna mount that is inexpensive and work well as a temporary antenna mount. What we needed is some type of antenna mount that would clamp onto a non porous autobody or glass window. This would make it ideal for use on a bus window. 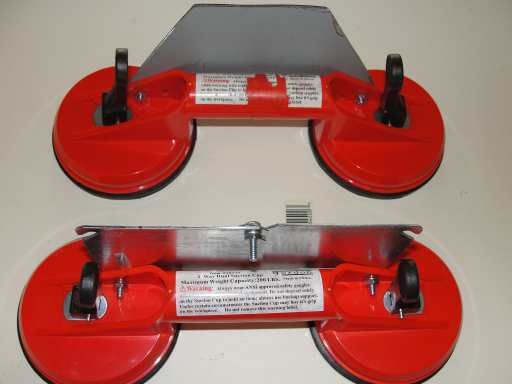 Suction cup lifters have been around for some time used in the collision center business to pull out minor dents in fenders and in the glass business to haul heavy glass panels. Harbor Freight Tools carries a very nice dual cup suction lifter that is normally available in their stores. It is stock number 46134 and retails for only $7.99. Many times I see it on sale for only $5.99. 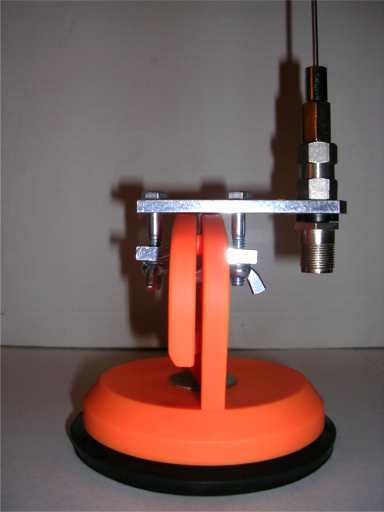 This will form the base of a simple temporary use antenna mount. In my design, I simply cut a small piece of sheet steel from my junk stash and connected it to the suction cup lifter using several small # 10 - 24 3/4 inch long machine screws with nuts and lockwashers. In my second design change I picked up two steel 4 inch by 4 inch electrical junction box blank plates from the home store. They bolt together easily and cost about 0.50 cents each. 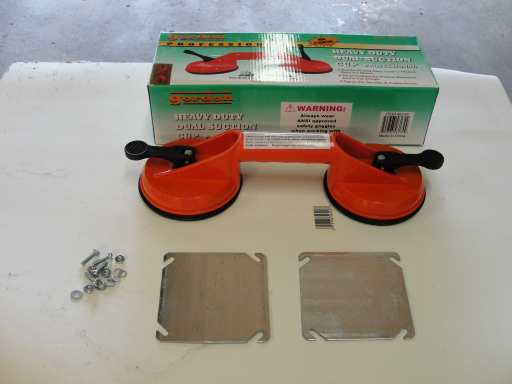 All that's needed is to drill two small holes in the grip of the suction cup lifter handle assembly to hold the plate. This assembly provides a strong versatile antenna mount that holds securely to the side glass of modern day busses. One can be easily assembled for under $10.00. Grab your small magnetic mount antenna, suction cup mount and you're ready to setup reliable communications for almost any event. Just the thing for this years public service events !. I have used one for a few years and the mount held securely for over four hours during the Akron Marathon. Some pictures of the mount are shown below. The top mount is my first version using a piece of scrap steel I cut from an old enclosure. The bottom mount is my second design using two blank J-Box cover plates. The view from below showing the mounting screws through the handle grip. The finished mount attached to my car side window. (Jan 15, 2006) -- Public Service communications takes on many forms. Everything from participating in annual parades to marathons and charity walks for civic organizations are but a few of the many events we assist with each year. Here in Stark County we are fortunate to have several high profile two meter repeaters at our disposal to use during these events. While they have very good range, they were never intended to support using only hand held radio's using only short rubber duck antenna's. A hand held however maybe your only option. Depending on the nature of the event, you may be asked to ride along in some "official" vehicle. This could take the form of a Red Cross ERV, Emergency Services Ambulance or Rescue Squad, or even a Transit Bus. Most of the vehicles have nice metal roofs that work great using simple magnetic mount antennas. This greatly increases your range when using only a low power HT radio. What if the vehicle doesn't have a metal roof ? Several vehicles now sport aluminum or fiberglass bodies making it impossible to use magnet mount antenna's. It was with this in mind that I began looking for alternative antenna mounts that could be used in these situations. The first was easy and already available. This aluminum clamp mount came complete with a simple screw clamp that will work fine with the large side mirrors commonly found on large trucks and Rescue Squads. I found it at a well stocked antenna supplier at a local hamfest. The mount came complete with a SO 239 connector and a 3/8" stud mount whip antenna and cost less than $ 10.00. A quarter wave whip antenna sized to fit the stud mount cost another $ 5.00. Figure 1 shows the complete mount. 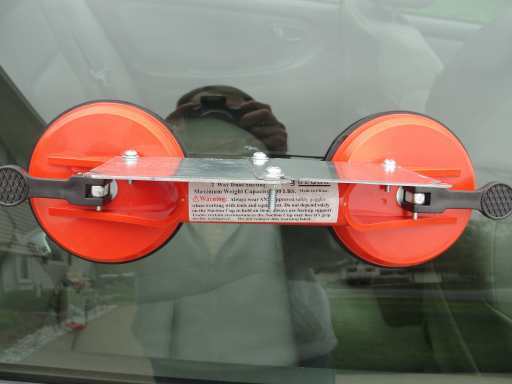 The next mount has been around for a while and is based on a simple heavy duty suction cup that is commonly used to pull out minor dents in auto bodies or to carry plate glass. I found the suction cup at a Harbor Freight Tool store for only $ 4.00 on sale for a 4 1/2" size. It's constructed around a 4 1/2" pliable rubber cup that creates enough suction to pull an 80 pound object. This should be more than enough to hold on to an autobody or a smooth plate window of an ambulance or transit bus. A plastic handle folds to create the suction. The antenna mount for this is a simple two piece aluminum clamp also found at the same well stocked antenna supplier at a cost of about $ 5.00. I replaced the hardware with two 1/4" hex head bolts and easy to tighten wing nuts that clamp around the suction cup handle to form a solid mount that will easily hold the 1/4 wave 3/8" stud mount whip antenna. A short length of feedline with a BNC connector for the handheld and you are ready to go. This completed mount is shown in figure 2. Both antenna mounts cost about $ 10.00 each and are capable of being used on just about any type of personal or commercial vehicle in use today. I wish we would have had a few of these during the Great Ohio Bicycle Adventure (GOBA). They would have worked great on the two Rescue Squads that roamed the course. These will make a great addition to your ARES Go-Kit and will allow us to provide effective communications in almost any situation or vehicle using just your 5 watt hand held radio. Time to get to work !